You have found us! 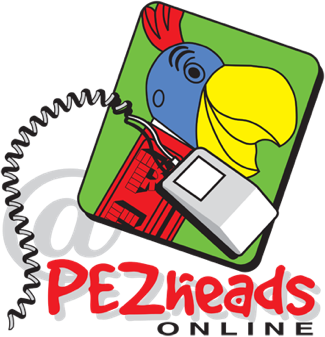 This is the Original PEZ Collecting Email List! Are you ready to talk stems, variations, patents, sleeves, stratzenfurters and much much more with over 1000 PEZ collectors around the world? Then dive right in – read the list guidelines and then join us! You are smack dab in the middle of the evolution of a PEZhead. Oh sure, it starts innocently enough. A PEZ here, a PEZ there. They look fun... Before too long you realize that you have several and wonder if there are others to be had. From there, you seek out PEZ locally at retail stores. Before too long you realize that you are now "collecting" them. And as such, the thought that others might also collect them causes you to search them out. Then you find PEZheads. Your life has changed. You may not realize it yet, but it has. You are now main-lining info on PEZ straight into your head. You found us. And we understand. We've all been there. Look what's ahead of you: You will complete your collection of "domestic" PEZ and the "PEZzy dance of joy" in the grocery store will soon fade. You will discover flea markets and antique shops. Your eyes will quickly learn to discern the shape of a PEZ from an entire BOX of happy meal toys. Your average price per PEZ will increase from $1 to $5 to $10 as you start to get into older PEZ. From time to time, you will score a new PEZ that you didn't have. Eventually, the flea markets and antique shops will be tapped out (particularly if you live in an area with other collectors). You will then proceed to looking for PEZ in alternative locations (i.e. the Internet). You will find web pages, make contacts with people in other hobbies and eventually, find eBay. Your average price per PEZ will escalate from $10 each to as high as $100 each! (Perhaps more). You will discover that the absolute best place to find elusive PEZ is at the various PEZ conventions. What you won't understand until you get there is that the value of the convention is not the PEZ, but the people. The PEZ is a bonus. There your price per PEZ can easily go well over $200 each. From there, you coast a bit. You talk to people and let everyone you've ever met, know you collect PEZ (in the hopes of scoring that shoebox that someone's Mom has in a closet somewhere). You will be answering more questions than you ask. Welcome aboard. Get comfortable, it’s a long ride."